Two lots available in a highly visible location on New Circle Road and Russell Cave Road. The lots are available for Ground Lease or Build-to-Suit and can be leased together or separately. The existing pylon sign on New Circle Road is available to the tenant. The landlord will provide a clear pad ready site. 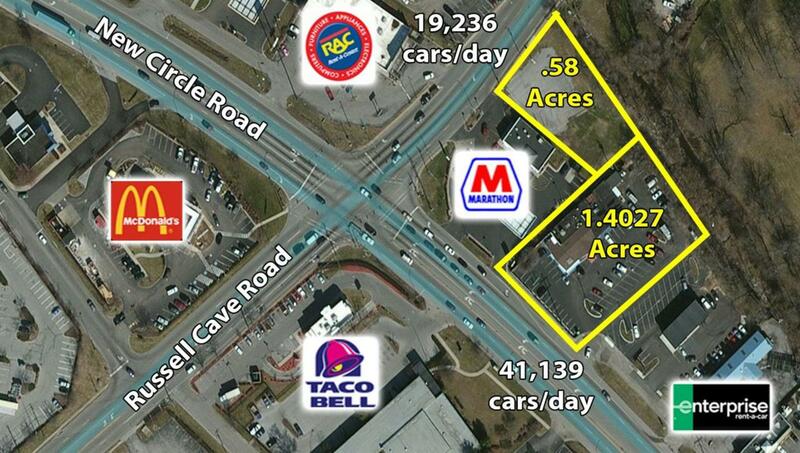 295 W. New Circle Road: 1.47 Acres at $5,000/month + NNN & 1500 Russell Cave Road: 0.58 Acres at $1,500/month + NNN. Lots can be combined for a total of 1.98 AC where the site can function as a signalized corner with ingress/egress to New Circle Road and Russell Cave Road. Zoning includes a multitude of uses including fast food or QSR restaurants, banks, automotive, and professional/medical office.